The March Basket quilt block makes good use of the half square triangle patches. 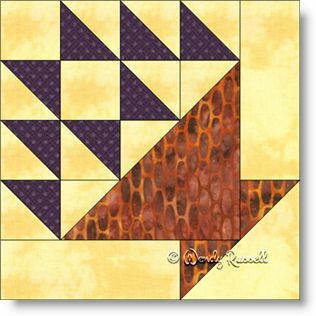 This 10" quilt block can be used in a variety of ways in your quilt, simply by rotating the blocks in different directions. The construction of the block is a little different than the "norm" as you create several different rows and then, at times add a single triangle to the grouping. Nothing difficult, just a bit different. In the sample quilts illustrated, I have chosen four blocks at a time and laid them out in several different variations of 90 degrees. As you can see, secondary patterns emerge as a result of these rotations. The only limiting factor in coming up with your own unique quilt is your imagination.